The discipline of biomolecular engineering focuses on the interface between molecular biology, biophysical chemistry, and chemical engineering — with the goal to translate our fundamental understanding of molecular biology into useful therapies, devices, and processes. 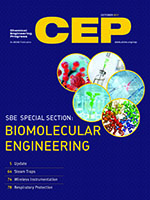 The topics covered in this months special section convey the breadth and depth of emerging areas of biomolecular engineering. Other topics in this issue include steam traps, wireless instrumentation, and respiratory protection. Imagine my excitement when I saw the cover of the latest Reader’s Digest; it was the Genius issue — boasting “Secrets to a sharper mind” and “Why it pays to increase your word power.” I couldn’t wait to dig in! I’m a long-time subscriber — I started reading my parents’ copies when I was in elementary school — and I have always enjoyed the monthly vocabulary quizzes. And now, here was an entire issue with words as its theme. How exciting! The discipline of biomolecular engineering focuses on the interface between molecular biology, biophysical chemistry, and chemical engineering — with the goal to translate our fundamental understanding of molecular biology into useful therapies, devices, and processes. Applications of this discipline include clinical medicine and developmental biology. The widespread adoption of vaccines over the last two centuries has transformed medicine by preventing infectious disease. In the future, so-called therapeutic vaccines could be used as effective treatments for cancer and autoimmune disorders — ushering in a new era of medicine. Adoptive T-cell therapy is a personalized cancer treatment that has the potential to cure previously untreatable malignancies. Researchers are applying techniques in biomolecular engineering and synthetic biology to the development of next-generation therapeutic T cells with improved safety and efficacy against a variety of cancers. Proteins could transform the chemical process industries if they could be engineered to facilitate the production of biofuels, molecular medicines, and other specialty chemicals. This reality is nearing as expanded knowledge of proteins and improvements in computational tools are making it possible to design specific protein structures and functions. Single-cell RNA sequencing is giving engineers and scientists the ability to better understand and manipulate the smallest unit of a living organism — the single cell. This technique has already ushered in breakthroughs in biology and medicine. However, challenges and opportunities abound. Narrowing the metabolic engineering divide between plants and microorganisms will require faster design-build-test cycles and better genome engineering tools. A robust steam trap management program will help you maintain steam system reliability and avoid water hammer damage. Wireless adapters help plants acquire stranded data from HART-enabled instrumentation to reduce operator rounds, prevent overfill, track inventory, and more.